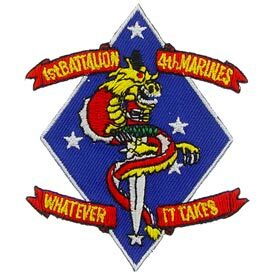 1st Battalion, 4th Marines (1/4) is an infantry battalion in the United States Marine Corps based out of Marine Corps Base Camp Pendleton, California consisting of approximately 800 Marines and sailors. They fall under the command of the 1st Marine Regiment and the 1st Marine Division. The battalion was originally activated in April 1911 as the 1st Battalion, 4th Marine Regiment. The battalion first saw combat action in November of 1916 in the Dominican Republic where the men of the battalion bravely fought and where 1st Lieutenant Ernest Williams was awarded the battalion’s first Medal of Honor. The mission in the Dominican Republic was to protect foreign lives and property and to provide the “muscle” for a military government whose strategic goal was to bring stability to the troubled island republic. In 1924, the battalion returned to its home base in San Diego, CA. During 1926 to 1927 the battalion guarded mail in a variety of outposts throughout the Western U.S. The period from February 1927 to November 1941 was the China era in the battalion and would leave an enduring mark on its history. This service in Shanghai earned the battalion the title “China Marines” and started the practice of using the Chinese dragon in different official and unofficial logos and mast heads. In November 1941 the battalion along with the entire 4th Marines deployed from China to the Philippines. The outbreak of World War II found the battalion serving as part of the U.S.Forces defending the Philippines. Ordered to the strategic island of Corregidor, the battalion fiercely defended their assigned sectors against overwhelming enemy forces. In the end, General Wainwright, United States Army, ordered the battalion to surrender, in an effort to save lives against the hopeless situation. After the surrender, the battalion ceased to exist. As prisoners the men would endure torture and incredible hardships. In the spring of 1965 the battalion deployed to combat in Vietnam. From 1965 to 1969 the battalion engaged in numerous conventional and counter-insurgency operations in the I Corps. Named Operations such as Prairie, Beacon Hill, Desoto, Deckhouse and Purple Martin would be fought from places such as the Rockpile, Camp Carroll, Con Thien and Vandergrift Combat Base. Corporal Larry Maxam and Private First Class Douglas Dickey both heroically gave their lives in Vietnam and were posthumously awarded the Congressional Medal of Honor for their brave actions. From October 1969 to 1977 the battalion would serve in Okinawa and also off the coast of Vietnam. A significant event that occurred during this period was the battalion’s participation in the rescue of the SS Mayaguaz along with supporting the Southeast Asia emergency evacuations. In 1977 the battalion moved to Twenty-nine Palms, CA and remained there until 1989. In January 1989 the battalion would be assigned to 1st Marines at Camp Horno, aboard Camp Pendleton. In August 1990 the battalion deployed aboard ship to the Persian Gulf in support of Operation Desert Shield/Desert Storm. The battalion’s history during the 1990s and into the 21st century would be highlighted by expeditionary operations in support of national objectives in Southwest Asia, Eritrea, Kenya and drug interdiction operations along the U.S. border. The terrorist’s attacks on 11 September 2001 began the battalion’s campaign in support of the Global War on Terror. In March 2002 the battalion served as a reserve force in support of the initial combat operations in Afghanistan. In March 2003 the battalion was part of the initial invasion in support of Operation Iraqi Freedom. The battalion fought in Nasiriyah, Al Kut and Bagdad. In May 2004, the battalion again returned to combat in Iraq which was highlighted by a major victory against insurgent forces in Najaf. In 2005 elements of the battalion supported Hurricane Katrina disaster relief efforts in Mississippi and Louisiana. From 2006 to 2009 the battalion conducted two more tours in Iraq. These tours were in Al Qaim and the war torn city of Fallujah. The battalion would be the last infantry battalion of Marines to leave Iraq in February 2009. In May 2010 the battalion attached to the 15th Marine Expeditionary Unit (MEU) in support of the Western Pacific deployment. During this deployment the battalion executed the first anti-piracy in the Marine Corps in over 200 years by capturing the pirated motor vessel, Magellan Star.